Fairy tales, pop-up books, and legos. These three staples of childhood come together in Lego’s newest toy “Once Upon A Brick”. The 859-piece set lets kids build scenes from two classic tales: Little Red Riding Hood and Jack and the Beanstalk. 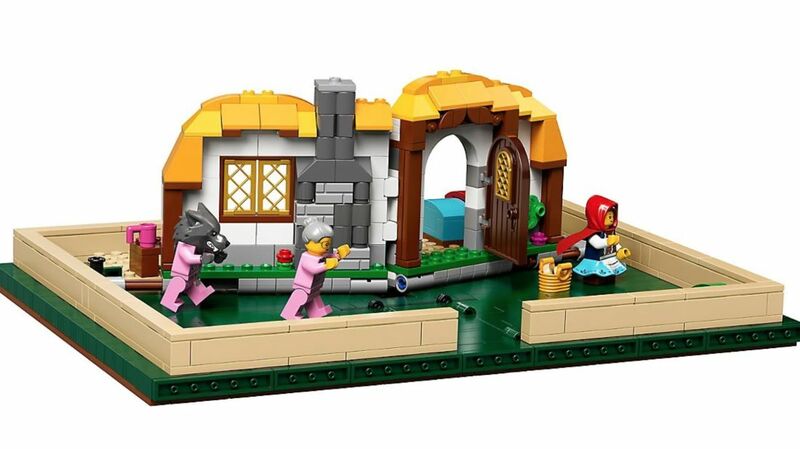 Five mini-figure characters are included in the set, including Little Red Riding Hood, Grandmother, the Wolf, the Giant, and Jack. Image via The Lego Store. This perfectly combines story time with the creative challenge that Lego toys bring. Earlier this month Lego announced the release of “Once Upon A Brick” on Twitter. Although the promotion is similar to Samsung’s $2000 Galaxy Fold phone, thankfully the price is much more reasonable at 79.95 Euro, roughly 90 US dollars. It may be a little too early to start Holiday shopping, but this looks like a pretty darn good gift! Featured Image via Stuck In Plastic. The holidays are a perfect time for Harry Potter fans to shop! New toys and deals have been announced for this coming holiday season, we at Bookstr are living for it! LEGO, Funko Pop and Loungefly are rolling out some new items that will get your potions bubbling! LEGO is offering a superb deal, The Diagon Alley set will be free with a purchase of a second set. If you love their brick sets, you know how great they are and why you should get one. The Diagon Alley set is equipped withGringotts Bank, Flourish and Blotts, Quality Quiddich Supplies, Weasley’s Wizard Wheezes and Ollivander’s Wand shop. The set will be available for free with a $99 purchase from November 9th – 21st. Funko Pop is releasing a new pop figure to add to your shelves! Hedwig spreads her wings and come backs to life in this new figure. The pop figure features Harry Potter and his beloved owl Hedwig moments before going through the wall at Kings Cross Station on Platform 9 ¾. And if you can’t get enough of Hedwig, Funko Pop is also promoting Loungefly’s new product that will feed your Potter fan soul. Loungefly has announced its new BoxLunch exclusive, a Hedwig backpack! This snowy owl backpack is a must have for this holiday season. Both the Funko Pop and backpack will be available for purchase for November 3 and November 4 at the BoxLunch stores. Get your wizard and witchy friends this gear for this upcoming season, it’s a gift they will forever love you for! LEGO’s Huge New Hogwarts Set Almost Big Enough to Live In! Since they first started making Harry Potter toy sets in 2001, LEGO has put out four different Hogwarts sets, but the newest one puts all the others to shame. Previously, the largest set consisted of 1,290 pieces, but the new one more than quadruples that, clocking in at 6,020! It includes a wide variety of rooms including the Great Hall, the Gryffindor common room, and the Room of Requirement. It also comes with twenty-seven microfigures to populate it! There are also moving parts, like the Whomping Willow and a moving staircase. Mattel is about to release a set of six Harry Potter dolls, a lineup featuring Harry himself alongside Ron, Hermione, Ginny, and Professors McGonagall and Dumbledore. The new dolls look pretty nice. But there’s been no shortage of Potter dolls through the years. Here’s a collection of various forms Harry has taken on store shelves – the good, the bad, and the ugly. We’ll leave it up to you to decide which is which. While the original series may have ended years ago, there’s never been a better time to be a Harry Potter fan. Lego is channeling your inner creative child and releasing three new Potter sets, illustrating classic moments from the books. The new sets include an iconic Quidditch match from Sorcerer’s Stone, the Weasley’s car crashing into the Whomping Willow in Chamber of Secrets, and the intense Dementor attack on Hogwarts in Prisoner of Azkaban. In the humble beginnings, back when everyone thought Snape was evil, Harry and his iconic trio of friends thought he was trying to kill Harry during a Quiddich game. The set includes a build-able Quidditch arena along with figures of Snape, Hermione, Harry, and other players. After Dobby prompted the Dursleys to ban Harry from attending Hogwarts in his second year, Ron Weasley attempted to smuggle him back in through his parent’s flying car. The set includes a build-able Hogwarts, the iconic Ford Anglia, the Whomping Willow, and Harry and Ron. The train to Hogwarts departs from Platform 9 3/4 every fall, but in Harry’s third year it became a stalking ground for the terrifying Dementors. The set includes a build-able Hogwarts express, Platform 9 3/4, Dementors, Harry, and Ron figures.